As the cold weather approaches, we often take the time to clean up the exterior of our home or office building and clean up gardens and landscaping, but what about the asphalt pavement? Like your favorite perennial, your asphalt driveway or asphalt parking lot needs some attention and protective maintenance to prepare for cold weather. The asphalt paving contractors at Wolf Paving, servicing Milwaukee to Madison, have some simple things you can do to prepare your asphalt for winter and snow. Take a look at our helpful tips, below. As the weather starts to cool down, you might be surprised to learn that your asphalt is changing. As the freeze / thaw cycle begins in Wisconsin, asphalt expands and contracts with the moisture in the air and the moisture in the ground. Repair potholes so water doesn’t pool and expand, making the pothole larger. Fill any cracks in your pavement, so water cannot seep underneath the asphalt surface and comprise the sub-base. 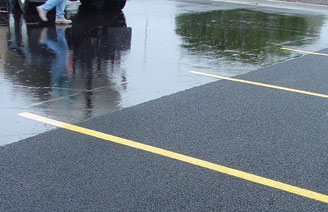 Sealcoat your asphalt to protect it from harsh winter weather and temperatures. Professional cleaning will reveal any existing structural issues, like cracks or potholes, which should be repaired immediately. 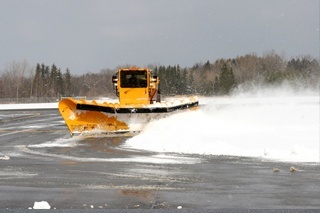 To make sure that debris does not interfere with the snow removal process. To ensure that large pieces of debris don’t freeze and damage your asphalt surface over the course of the long, cold winter. To ensure your asphalt still looks great once all of the snow melts, stock up on a few keys items every season. Purchase enough shovels for your home or business to ensure that snow and ice can be cleared away quickly and easily. Try to find shovels that do not have overly sharp edges that may chip or damage the pavement. If you need snow removal services for your business or municipality, consider what you should look for in a professional snow removal company. Simple things like a 24-hour dispatch services, removal of excess snow piles and DNR-approved salt storage sheds can make a big difference in the winter. Preventing ice and slippery surfaces from developing on your asphalt parking lot and your home or business entrance is important, but make sure you get the right products. There are many different types of de-icers on the market that are created for specific temperatures and results. 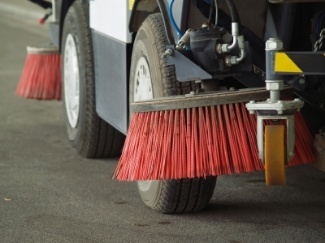 It is important to know that while de-icers do not deteriorate asphalt, they are not always environmentally friendly and should be used sparingly. If your business is seeing a lot of potholes developing, you may want to invest in using cold-mix asphalt for pothole repair. Professional asphalt contractors will know how to use cold-mix asphalt to help repair your potholes so they do not cause structural damage to your asphalt surface during the winter. At Wolf Paving, we have custom cold-mix asphalt designed specifically for Wisconsin winters and pothole repair. View our short and helpful video on the cold mix asphalt process. As you prepare for winter, take note of any areas in your asphalt surface where water tends to pool. You should note the locations so you can be sure to have those areas repaired in the spring, but also, to make sure you remove standing water before it has a chance to freeze and turn to ice. This is especially important in municipal and business parking lots and thoroughfares. Do you have additional questions about asphalt paving and winter weather? Contact us directly and we’d be happy to help! Request a Free Estimate for Paving Repairs or Snow Removal Now! For more information on Wolf Paving or to request a free estimate for your next paving project contact one of our two offices. If you live or work in the Milwaukee area, call us at 262-965-2121. For the Madison area, call us at 608-249-7931.